Mahaweli Development and Environment Ministry would buy a high tech ocean cleaning vessel through Spanish funds in near future, Deputy Minister of Environment Ajith Mannapperuma said. “The vessel is capable of cleaning waste in saline water,” he said. He was addressing a press conference at UNP headquarters Sirikotha this morning. The ship would be bought following a request made by the Mahaweli Development and Environment Ministry. He said the Ministry hoped to use the ship in special projects to clean 14 tourist beaches and to upgrade them among the best beaches according to international standards. He said that a cleanliness of a beach was a main factor tourists considered when making decisions on destinations. The Deputy Minister said the ship would be also used in removing oil spills like the recent incident at the Uswetakeiyawa Beach. 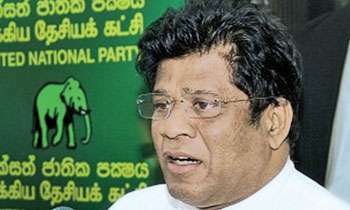 He said that the President had already discussed with the Minister of Ports and Shipping, to lease out the ship to the Sri Lanka Port Authority (SLPA) when the vessel was not engaged. He said the Government could settle the funds obtained for the ship to the Spanish Government. IS IT THE NEED OF THE HOUR ? .
" buy" with commission on credit? Our tax to pay? What about our Rupiyal ? make to 200 per $ before leave. Aney! As a priority, clean our village wells and waterways that are polluted by toxic run-off from Glyphosate and herbicide. Every time the government proposes to purchase something, i get upset, because i know that someone somewhere in whichever government is getting rich solely on commissions..
Can’t anyone find a mechanism to clean out corruption and fixes it for the parliament? There is a mechanism to clean out corruption. It is called capital punishment! Good idea.But the timing ? got an opportunity for make commission? Is this A OCEAN CLEANING SHIP the NEED of the HOUR .